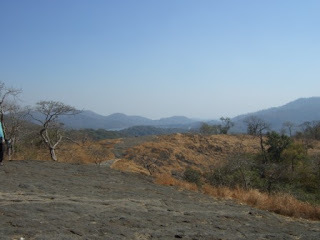 Mumbai with its dusty roads also has a very large national park laying in its heart. Apart from the personal longing to see the woods and animals the traffic drives me towards nature. Literally also: it's a 40 minute drive. Once there I compensate for not having helped anyone financially the other day by taking a guide. Not official of course. 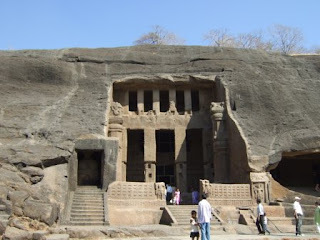 The Kanheri caves lay in the western part of the Sanjay Ghandi National Park (104 sq km). The caves were hewn out of granite rocks by 300 men for 150 years. Now that is persistent! Four types of excavations can be recognized: big rooms 'for worship of the Buddhist community', smaller 'monasteries with single and multi celled rooms where monks reside', water basins and trenches and benches. It is estimated that around 600 people used to live here. 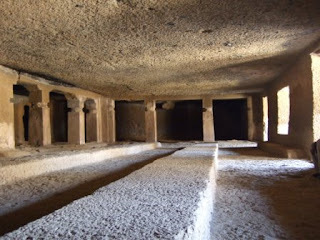 One cave with a stupa inside has amazing acoustique. The guide sings an enchanting song and fortunately no other visitors enter to disrupt this wonderful experience. The cave springs to life. A small revivement of times past. Part of the excavations served not only as shelter but to aid in cooking or doing the laundry. In the walls statues have been cut out depicting the Buddha sitting on a naga supported lotus. Incredible craftsmanship to cut this from the tough rock. Having arrived at the end of my trip I feel a little unsatisfied. It was too short, I want more. So I urge the guide to walk me to the lake. He is hesitant: "now is ok, but in evening tigers and leopard". Wandering of the patch of archeology drives us out into the jungle. He really wants to go back. Admittingly he adds: "first time I go this far". I laugh and he turns and starts walking back. On the way back we drive past a Jain temple. There seems to be a festival. Pulling over seems strange to the Indians as I am the only white guy around. The Jain are celebrating in a huge tent. At the front children in beautiful garments dance and sing. A peaceful place. 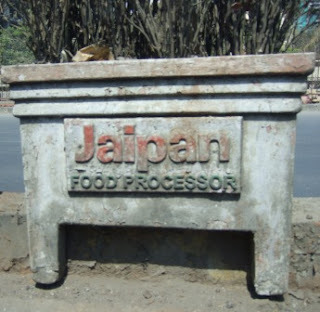 The adjacent Jain temple beckons. Three huge marble(?) 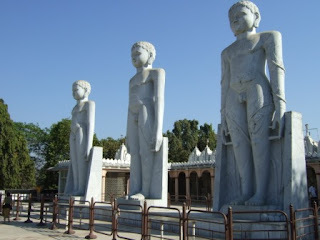 statues arise at the end of a huge square. Children are playing and beneath my feet the broken rice of worship tingles. As I ask my guide what the different symbols mean he delegates the question to a curious boy. Suddenly, 50 children have gathered around me. A frank young girl named Pinki (like the one on your hand? Everybody giggles. Nooo!) 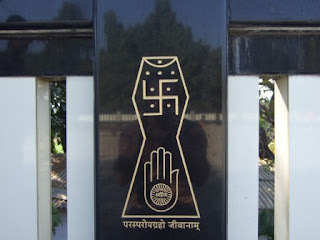 speaks up in nearly perfect English and explains that the Jain hand and symbol inside means 'non-violence'. Logically I have to share what country I am from. 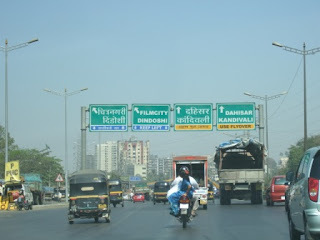 Always good for people to know that you come from a country with fewer inhabitants than Mumbai itself. Satisfied they go about there merry way. 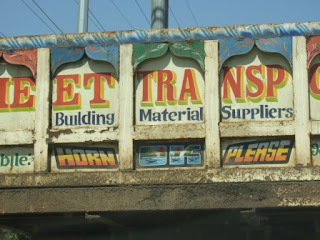 Consider this particular request honored!